Thank you JooJoo for tagging me and giving me the Kreativ Blogger Award! Below is my list of the 7 things that I love; surrounded by a few of the items I enjoy eatting! You know, if I could place an #8 on my list it would be that I just LOVE random acts of kindness. It's a wonderful thing to receive; but when you do an act of kindness, the feeling is simply terrific! So now, I'm going to pass on the Kreativ Blogger Award and see what others love! OH Nancy..this is so great. I really enjoy learning tid bits about people I have come to know. 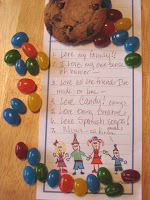 You and I share many of the same 'loves'.especially the candy one! I am a jelly bean whore...so it's nice to know there are others out there! I will take some time today to compile a list of 7 things and create a blog post..Thanks so much for adding me to your list..and I too adore random acts of kindness..on that note..your one of a kind special ears are on their way to you as I type this! Hope you love them as much as I did in creating them especially for you my friend! OK Nancy..I did not procrastinate on this one..I got right to it so you can take a peek at 7 things I love..and if I had a #8..I'd say that I LOVE you my friend!